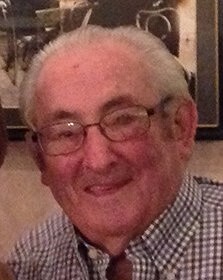 Obituary for Achille "Chic" Rossi | Thompson-Marodi Funeral Home, Inc.
Achille “Chic” Rossi, until recently a long-time resident of Marianna, went to the loving arms of our Lord on October 9, 2018. Chic was born April 26, 1930, in Charleroi, the first of four children born to Antonio & Eufemia (Faye) Rossi. He graduated from West Beth High School in 1949. After working years at BethEnergy’s Mine 58 in Marianna, he retired when a fire caused the mine to close. Preferring to remain active, he participated in baseball, bowling, and golf, helped with Meals on Wheels, Marianna Volunteer Fire Company and the American Legion. He recently moved to Strabane Trails in Washington. For many years, he faithfully attended Saints Mary and Ann Parish, Marianna. Later he went to Saint Katharine Drexel Parish, Fredericktown and recently, was at Immaculate Conception, Washington. Surviving him are his children: Marcia Rossi and Christine (Rossi) D’Orazio of Washington, Dino and Darlene (Pettit) Rossi of Scenery Hill, Tina (Rossi) and John DeJuliis of Bentleyville. They gave him six grandchildren and seven great-grandchildren. His stepchildren are Elizabeth Holmes and Donna Bentley of Oldsmar, Florida, and William and Cheryl Jo Holmes of McKees Rocks, PA. They gave him four grandchildren. Surviving siblings are Ann Iddings and Quin Bernardinelli. Predeceasing him, first wife, Marion (Rendulic) Rossi; second wife, Barbara (Holmes) Rossi and brother, Dominic Rossi. Friends are welcome from 2 to 3 p.m. Friday, October 12 at the Thompson-Marodi Funeral Home, Inc., 809 Main Street, Bentleyville, 724-239-2255, where a blessing service will immediately follow with the Reverend Edward L. Yuhas, Administrator of St. Katharine Drexel, officiating. In lieu of flowers, the family respectfully requests memorials to American Cancer Society, 320 Bilmar Drive, Pittsburgh, PA 15205 (www.cancer.org). Visit www.thompson-marodi.com to leave a condolence message and share photos.